Bloody Mary is a ghost or witch featured in Western folklore. She is said to appear in a mirror when her name is called three times or sometimes more, depending upon the version of the story, often as part of a game. 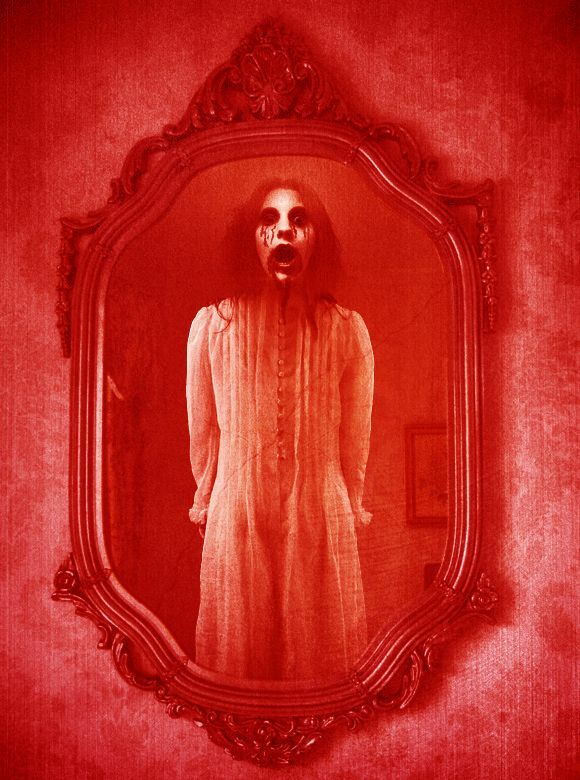 One of the more common ways participants attempt to make her appear is to stand before a mirror in the dark (usually in a bathroom) and repeat her name three times, though there are many variations including chanting a hundred times, chanting at midnight, spinning around, rubbing one's eyes, running the water, or chanting her name thirteen times with a lit candle. In some versions of the legend, the summoner must say, "Bloody Mary, I killed your baby." In these variants, Bloody Mary is often believed to be the spirit of a young mother whose baby was stolen from her, making her mad in grief, eventually committing suicide. In stories where Mary is supposed to have been wrongly accused of killing her children, the querent might say "I believe in Mary Worth." This is similar to another game involving the summoning of the Bell Witch in a mirror at midnight. The game is often a test of courage and bravery, as it is said that if Bloody Mary is summoned, she would proceed to kill the summoner in an extremely violent way, such as ripping their face off, scratching their eyes out, cutting their head off, driving them insane, bringing them into the mirror with her or scratching their neck, causing serious injury or death. Some think if she doesn't kill the one who had summoned her then she will haunt them for the rest of their life. Other versions tell that if one chants her name thirteen times at midnight into a mirror she will appear and the summoner can talk to a deceased person until 11:08a.m., when Bloody Mary and the dead person asked to speak to will vanish. Still other variations say that the querent must not look directly at Bloody Mary, but at her image in the mirror; she will then reveal the querent's future, particularly concerning marriage and children. Divination rituals such as the one depicted on this early 20th century Halloween greeting card, where a woman stares into a mirror in a darkened room to catch a glimpse of the face of her future husband, while a witch lurks in the shadows, may be one origin of the Bloody Mary legend.Bloody Mary Worth is typically described as a child-murderer who lived in the local city where the legend has taken root years ago. There is often a specific local graveyard or tombstone that becomes attached to the legend. On the other hand, various people have surmised that the lore about taunting Bloody Mary about her baby may relate her tenuously to folklore about Queen Mary I, also known as "Bloody Mary", whose life was marked by a number of miscarriages or false pregnancies. Speculation exists that the miscarriages were deliberately induced. As a result, some retellings of the tale make Bloody Mary the queen driven to madness by the loss of her children. It is likely, however, that Queen Mary only provided her nickname to the Bloody Mary of folklore. She is also confused in some tellings of the story with Mary, Queen of Scots. The mirror ritual by which Bloody Mary is summoned may also relate to a form of divination involving mirrors and darkness that was once performed on Halloween. While as with any sort of folklore the details may vary, this particular tale encouraged young women to walk up a flight of stairs backwards, holding a candle and a hand mirror, in a darkened house. As they gazed into the mirror, they were supposed to be able to catch a view of their future husband's face. There was, however, a chance that they would see the skull-face of the Grim Reaper instead; this meant that they were destined to die before they married. The legend of Bloody Mary has served as inspiration for a number of movies and television shows dealing with the supernatural. In Clive Barker's Candyman films, the Candyman is summoned in a similar way. In 2008, for its annual "Halloween Horror Nights" events, Universal Studios Florida developed a new variation of the legend. In their version, "Mary" was a doctor who studied fear by exposing her patients to the thing they feared the most. During the experiments, Mary would sit behind a one-way mirror; the patients would shout her name three times when they wanted the experiment to end. She was also parodied in South Park and replaced by Biggie Smalls. In a season two episode of Charmed named "Chick Flick" a Demon makes killers from different horror movies come to life, one of these killers being Bloody Mary. In the episode of Charmed, Bloody Mary is pale white and carries a knife to kill her victims with, also Phoebe informs the sisters that "Bloody Mary" can be killed if she falls or is pushed out a window. Also another appearance in the first season of the paranormal TV series Supernatural, in the episode called "Bloody Mary". The legend was also featured in the third season of TV series Ghost Whisperer, in the episode called "Don't Try This at Home." A few college students dare a girl to summon Bloody Mary but when she dies mysteriously, they believe that Bloody Mary is haunting and trying to kill them too because they were also responsible for bringing her back. The PlayStation 2 video game Twisted Metal: Black features a character named Bloody Mary, an insane woman who is extremely jealous of anyone who gets married. She murdered one of her best friends on the day of her wedding, and stole her blood-soaked wedding gown, which she continues to wear. In the X-Files episode "Syzygy" two high school girls are seen chanting Bloody Mary thirteen times in front of a bathroom mirror. In the Tim Burton film Beetlejuice, the title character is summoned to and from the living world by saying his name three times, and in the animated series that followed the movie, he is shown capable of mirror travel. In a Summer 2010 airing, Stephen Colbert parodied the myth, joking that a small percentage of the African American viewers of Fox News Channel only watched the network after saying Fox News anchor Glenn Beck's name into a mirror.